I’m just as much of a Super Man Otaku as I am of American Football. If it is there I’ll pay attention but other than that I have no interest in it. However, I have watched all the super man movies and I have watch every episode of the old school Superman show which stars Dean Cane as Clark Kent. Smallville was never that appealing to me. I wasn’t fond trying to contain annoyance watching Lana Lang toy with Clarks heart and be the dumb emotional school girl she is. I don’t like her character nor the actress who plays her. I was very excited for this movie when I watched the trailer and especially so when I saw Christopher Nolan’s name. I was never a big fan of Batman either but ‘The Dark Knight’ Series is just absolutely phenomenal. Also ‘Inception’ is also mind blowingly insane, and is one of my favourite movies as well. So I was stoked to watch this movie, and had high expectations for it. Im sure there are many out there who will agree that if Christopher Nolan’s name is attached to a movie then regardless of what its about it’s worth checking out. One thing that needs to be said before I get into the movie is this; I am not a professional movie critique. In fact, most of the time what I base how much I love or don’t love a movie is on how big of an emotional impact I get into a movie. Simply put – how much it moves me. That being said, noticeable flaws in storyline, cinematics, acting etc when noticed do have an impact of killing the moment, or ruining the buzz so to speak. So now that you understand where I’m coming from, Its time for me to fangirl. Overall I really enjoyed this movie. You could really tell that it had an underlining hint of Christopher Nolan’s charm in the whole movie. All the details in the cinematic and action sequences were so detailed unique and beautiful. Other than a few blips the storyline was good in my opinion. We got to see the beautiful Krypton before its doom and get a very good backstory structure for the story to build upon. The Acting was good for all characters. 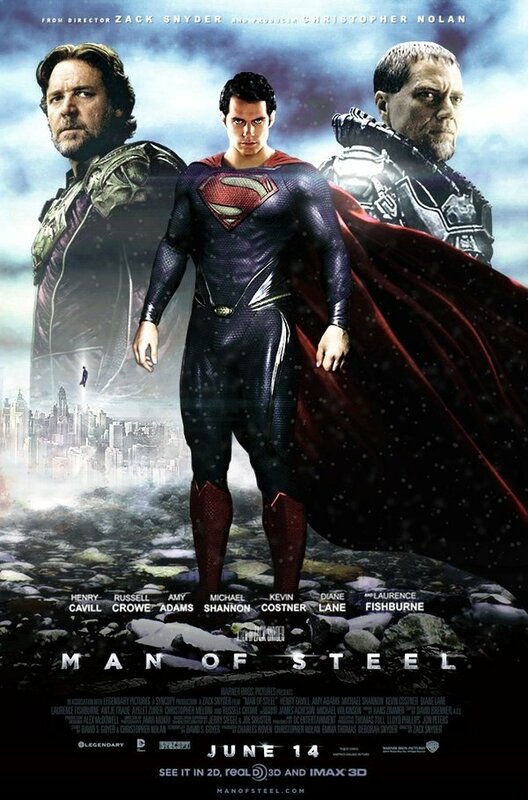 Russell Crowe as Jor El totally blew my mind! He totally stole the show away from everyone. Henry Cavill was not only brilliant but MAN is he nosebleed worthy. The way this man’s body is built is clearly out of this world. To see Laurence Fishburne, and Kevin Costner in this movie made me happy too. And I was so excited to see a few actors from Battlestar Galactica as well. There are variations in this version of the story that differ than from the other Superman movies and shows that I’ve seen but realistically, Every time something new comes out with superman the story always changes. Almost like its consistently inconsistent. There were quite a few times where there were annoyingly obviously corny lines that were meant to be humorous that I felt totally threw me off. I know that this is supposed to be a more lighthearted movie than the Dark Knight Series but there are smarter and more subtle ways to present humour. It kinda made me feel depressed for about 10 seconds every time something like that happened. There was also one or two instances where I feel the storyline was off. Where they wouldn’t explain things properly or made people do things for no reason. I don’t want to mention specifics in the story so I don’t ruin anything in it. That also didn’t sit well with me but other than that the rest of the movie (mostly because of Russell Crowe’s Awesomeness) made up for those things. I laughed and cried and sat at the edge of my seat. And at the end I applauded. I honestly am looking forward to buying this movie on BluRay. This was in my opinion the best Superman Movie I’ve seen. It gives a bit of a variation from the original story that I’ve come to know about superman, but then again I don’t know much about superman at all really and I’ve never read the comic books. As a person who isn’t into the comic books I was still very impressed on how well the story sucked me in and how amazing the action and everything is. I believe that anyone would be able to enjoy this movie, wether you are otaku or not.